Metal forming using deep drawing has its advantages and disadvantages. In general, the deep drawing method is highly valuable for large quantity or long run production orders for multiple reasons. That’s one of several reasons it’s been a trusted form of metalwork for hundreds of years. Deep drawing is among the most commonly used methods in sheet metal forming. 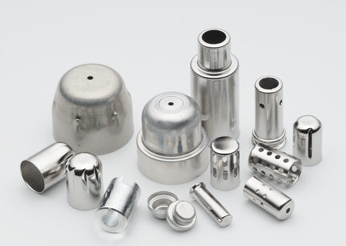 It’s utilized to form metal products and components deeper than what standard metal stamping are capable of. It’s also applied to a variety of industries and almost any can reap the benefits although it’s most often employed in the house appliance and automotive manufacturing industries. The deep drawing method is typically associated with lower costs of raw materials than traditional methods. Deep drawn parts can typically be combined with multiple manufactured components into a single deep drawing process, lowering assembly prices by removing multiple assembly steps. 1. Deep drawn stamping is advantageous for use in production or projects requiring seamless elements, rapid cycle times, complicated axi-symmetric geometries, as well as minimal labor. 2. The method hardens the metal, which yields finished components that are measurably stronger than machined or otherwise cast metal components. 3. Although initial setup costs are often high, the overall process can be automated, making it very easy to produce quantities in the thousands and even millions. 4. Waste material created during the deep drawn stamping method may be recycled for later use in other applications. One main disadvantage to the deep drawing process is that it isn’t valued as effective in small quantities. The cost of press setup is remarkably high and requires significant experience and expertise, rendering deep drawing more expensive for short runs. Generally, for deep drawn production to be cost effective, the minimum order quantity should be in the hundreds. Additionally, deep drawing carries formability limitations of standard deep drawing, posting a barrier for some industrial uses. Radial drawing stress and tangential compressive stress are common concerns, as these stresses may result in wrinkling, fracturing, and/or cracking in some processes. Alternatively, some unconventional deep drawing techniques have been used instead, which have helped to increase the industrial uses. These methods include hydro-mechanical deep drawing, hydraulic deep drawing, hydroforming, and aqua drawing.